Let’s be real for 10 seconds. Recruiters have a reputation that precedes them. Just like Prosecco, some love them, some hate them, and others, don’t even know of them. The biggest goal of any corporate recruitment service is to help companies find the best talent possible. Enter you, a talented job seeker. Naturally, you’d think that reaching out to a professional headhunter would help both of you, well—help each other out. Except, doing so raises so many questions that even Prosecco won’t help: How do I reach out to a placement agent near me? What’s the best employment recruiter for management positions? How do I find a job through a headhunter service? Way too many questions we could list here, but not to worry, in about 6 min you’ll learn how to find and use recruiters to get your dream job like you were born to it. Where to search for a hiring recruiter. How to pick the best recruiter who’ll get you hired faster. 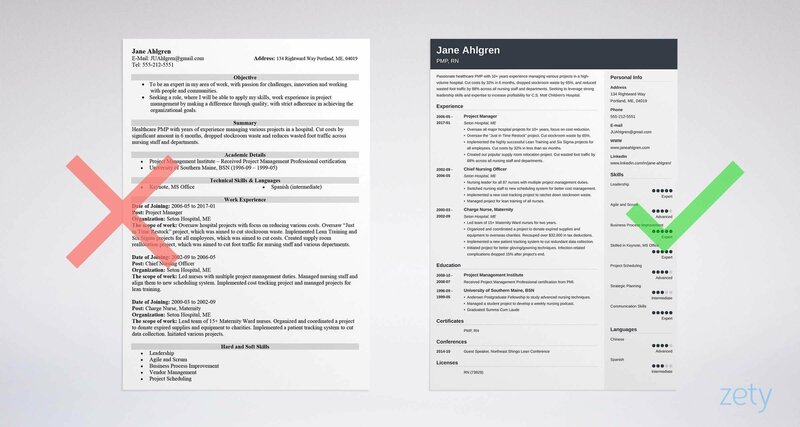 Tips and examples of an effective resume that’ll get the top recruiters to work with you. How to approach and negotiate your salary with your professional headhunter. How to use your experience with search firms to improve your job search. Resume Examples - See more templates and create your resume here. Headhunters are basically the recruiting world’s version of bounty hunters. When law enforcements need extra help, they often contract the help of bounty hunters. Sometimes, recruiting companies need extra help too! And this is when they outsource the job to headhunters. They’re professional recruiters who can work solo or for a staffing agency. Since the positions they’re usually contracted to fill are quite urgent, they’re known for their large network, sometimes even identifying candidates who might not even be looking for new roles and nurturing them towards their client’s company. Recruiters usually work for a given company and they function as an external arm of their human resources department. Their mission is to find suitable candidates for open positions at their company. They’ll often scout for new talent in job fairs, colleges or various networking events. Unlinke headhunters, who will identify themselves as working for their external recruiting agency, recruiters will introduce themselves as employees of the company they’re hiring for. They are deeply involved with a client company’s internal operations and usually know more about the opening. Recruiters often work with a client’s own hiring manager. Recruiters act as the front line for a company and hiring managers work from the inside, but they often work together to find the right candidate at the right time. Hiring decisions are ultimately taken by hiring managers, because they’ll often be supervising hired candidates once the hiring process is over. You should know that hiring managers rarely reach out to candidates during the interview process, you’ll often get an update from the recruiter. If you do hear from the hiring manager, it’s usually a good sign that you’ve made it. A job agent is basically whoever is helping you find a job. That could refer to a job center, your college career advisor, a recruitment agency, a headhunter, or any employment office. How to Find a Headhunter Who Actually Finds You a Job? The truth is, anyone could call themselves a headhunter these days. But you’re not very much of a hunter if you don’t put food on the table. Or find a suitable role for your candidates. So your first step to finding the best headhunters for you, is to look for professional recruiters who have in-depth knowledge of and experience in the jobs they’re recruiting for. If you can work with specialist recruiters, that’s even better. These people generally put in the time and the effort to nurture a good network of both client employers and candidates to find suitable opportunities for both. Generalist recruiters aren’t able to build long-term relationships because they might be working as a headhunter for IT jobs today and filling food service jobs tomorrow. If you’re serious about your next steps, a specialist recruiter is more likely to understand your skills and profile, and also more likely to finding you a job. Contacting recruiters on LinkedIn is your best bet. We’ll show you how to find recruiters on LinkedIn in the next section. Just bear in mind there are alternatives. There are several online recruitment directories out there to help you identify the best search firms for your geographic area, your industry and your specialty. The most popular free recruiting service is probably Oya’s directory of recruiters. A simple search on Twitter for “hiring now” or “recruiter looking for” will land you on various profiles relevant to your industry. You can also use Facebook to get in touch with a few professional recruiters via their company’s Facebook page. More often than we’d like, a simple Google search gets us a long way. You could simply input keywords such as “search firms” or “executive headhunters” followed by your industry and location. Ever heard of that catch phrase “Content is King”. Tell us about it! Recruiters nowadays are no different. They’re actively using content to attract clients, connect with candidates, and enlarge their networks. Occasionally browsing through high profile publications in your industry will often land you on an article written by a headhunter or a representative of a search firm. Some publications like Forbes even have rankings of the best recruiting firms of the year. Using this list, you could head to LinkedIn and select profiles of headhunters who most fit your requirements. You can follow them and see their job listings too! There are companies that will work as company hunters for you. They will find you relevant fitting jobs, fill out the applications for you, find references and other contacts to speed up your interviewing process, and even help you with interview preps. One of them is Find My Profession's Career Finder. Don’t forget you have a network of your own. And just like you’d prefer eating at a restaurant your friends rave about, you’d probably prefer working with a professional recruiter tried and tested by your network. Reach out to your LinkedIn contacts, alumni, or friends and family to ask whether they have a recruiter to recommend. Bonus point of this method is that you’ll be recommended to job recruiters who might be approaching you before you even reach out. You should also be making it easier for them to find you. Career hunters also scout databases of candidates on job boards. Having a solid profile on niche sites in your field will get them to engage with you if you’re a fit. Developing a rich LinkedIn profile with recommendations and well-written summary is an effective step to increase your visibility. And so is presenting at conferences, publishing articles, or attending events relevant to your industry. How much does a headhunter cost? Pretty much nothing. Working with a recruiter or headhunter is completely free. However, if you find one you really want to hire on your behalf, then you would have to pay their fee when they find you a job. Pro Tip: You should consider starting your own website or blog to disseminate your thought leadership. It will help you get on the headhunters’ radar and position you as a leader in your industry. 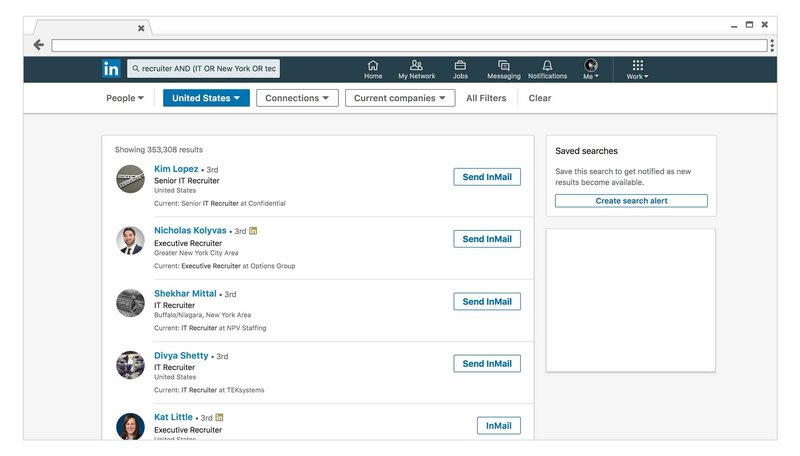 How to Find Recruiters on LinkedIn? We hear you. You wish there was a Tinder or Bumble for finding the right hiring recruiter for you. Instead, you’re left wondering how to initiate a relationship with professional job hunters. Good news pal, there is a huge number of corporate recruiters and independent headhunters on LinkedIn. And here is how to find the ones relevant to you and your career. First step is to enter a search string related to the title of any recruiter’s profile. How to find an executive recruiter in NYC? This means we’re looking for an IT recruiter or tech recruiter, preferably in New York and dealing with executives. If you’re looking for a job abroad, consider adding local terms for recruiters. It’s better if you set the search parameters to your preferred location. Also, LinkedIn require their members to pick one industry for their profile. Most professional recruiters will choose “Staffing & Selection” or “Human Resources”. You can simultaneously search several industries too. So on top of “Staffing & Selection” and “Human Resources” you could add “Internet” or any relevant industry of your interest. This will help you maximize the results you’ll get. If you end up with too many profiles, then aim to limit excessive results by adding keywords and selecting a level of connection. Pro Tip: A great way to connect with hiring headhunters is to increase your own visibility on the platform. Look for important keywords from relevant job postings and make sure you sprinkle those in your profile. Recruiters will often search for specific keywords to find potential candidates. You’ve selected a few job recruiters in your industry and are now ready to hit the ground running. Except, you’re mortified. How do you reach out to headhunting firms without making a fool of yourself or hearing crickets after you press send? It’s relatively easy to find people’s email addresses these days. How to find a recruiter’s email address? While it’s marketed towards businesses, Chrome extensions like Hunter can help you find a recruiter’s email address without much trouble, and for free! (you’re allowed up to 150 searches a month in the free version). All you have to do is install the extension and head to a recruiter’s website or LinkedIn profile. Alternatively, you can just enter their name and their website and find your holy grail here. Whether you’ve scraped them using Chrome extensions or you found them listed on the professional recruiter’s website or decided to reach out via LinkedIn, the problem isn’t so much finding the contact address anymore, it’s what to include in your first reach out. First impressions are vital, especially in the professional world. And a cold email can be tricky. But reaching out to people you don’t know can be extremely rewarding, especially if you never had the benefit of scoring an introduction through a mutual connection. Here are 3 ways to engage hiring recruiters. Bear in mind that customization and research is key here to make the first approach work. Go on, don’t be shy and type away! I came across your article in Hotel Management on how companies can retain employees in the tourism industry and thought it was fascinating. I’ve recently moved to the Chicago area and I’m looking for exec positions with leading boutique hotels. Would love to discuss my skills and profile further. When is a good time to grab a quick coffee? This day and age, anyone can be a publisher. You should consider starting a blog, podcast or publishing via LinkedIn to increase your visibility. You can also use an informal interview with a professional headhunter to learn more about the company’s culture and hiring process. These are time consuming but as a prospective job seeker, it’s an effective way to start a valuable relationship with a headhunting consultant at your dream company or someone hiring for your hit list positions. I came across your profile and thought it would be interesting to schedule an informational interview to be featured on my LinkedIn Publisher. I’ve heard great things about IoT startups and would love to learn more about the hiring process and what you’re looking for in candidates. It would be part of an article series featuring local stakeholders in the IoT arena. The interview would take no more than 30 minutes and I’d love to stop by and meet you in person. When would be a convenient time for you? Sweet and short often works wonders. I recently applied for a job opening at Oracle Sales for the position of an Account Executive via your career site. The position fits perfectly with my experience selling 250k-500k deals for Miracle Software Inc.
I’d love to set up a call and talk about the position and my experience. How does Thursday 10.00 am or 5.00 pm sound? Pro Tip: If the job search consultant hasn’t responded after a week, you can send a quick note to give your email a little bump to the top of their pile. But please, don’t be a pest and drown them with emails, there is a sweet balance to aim for! How to Talk to Recruiters to Get What You Want? Past the initial stress of finding and reaching out to recruiters, you’re now left wondering how you’re supposed to communicate with them and make sure they understand your needs and requirements. You’re on you own here, but this doesn’t mean you should be desperate. You know what the first rule of the job search is? So when a hiring recruiter calls, ask key questions about the search firm he represents and do your research to find out if you’d like to work with them. Don’t forget to inquire about your headhunter’s own experience and their process. To each their own in this field. Note if they’re listening to you and if they’re really interested in your background and what you’re looking for. That’s right, corporate recruiters don’t work for you. Nevertheless, you have to make sure the recruiting headhunter understands your needs to ensure a successful match. Most headhunters are paid on commission, earning a percentage of your first year’s salary when you get hired. So the more money you make, the higher their rate will be too. On the other hand, recruiters working for staffing agencies are paid a regular salary, and sometimes a bonus (don’t worry, in both cases their compensation is paid by the company contracting them). Regardless, this often works in your favor. Until it doesn’t. Sometimes, they may encourage you to accept a low offer because they can’t find any other suitable opportunities for you. This is why you need to tell them in advance what salary range you’re after and what threshold you’re aiming for, highlighting what’s nonnegotiable for you. Never let anyone, job recruiters included, pressure you into taking a position you’re not comfortable with. Pro Tip: Hiring headhunters always appreciate honesty and professionalism. How you work with an employment agency is a direct correlation of how you’ll work with anyone. If you leave them with a great impression, they’ll make sure to convey their praises to the hiring company. Not everyone is actively looking for a new job position. But most of us would be down exploring a new opportunity that was picked for us. If you’re nodding with agreement right now, congratulations, you’re what we call a passive candidate. The good news is, you can still passively engage with professional recruiters. Before you ignore any headhunter connection request or InMail on LinkedIn, keep in mind that whenever you’ll start looking for a job in the future, you might need them to be by your side. And as history showed, that need for a new job might pop up when you least expect it. If you’re still in awe with the free lunches and free gym membership your current job offers (who’d ever leave that! ), that’s ok too. Just don’t dismiss the headhunter’s messages! Instead reply back letting them know you’re not interested at this time, but in case anything changes, you’ll make sure to notify them. If you’re the curious type, wondering what other opportunities currently exist in the market, that’s ok too. Consider partnering with a placement agency or professional recruiting company on a confidential search. This way, you’ll avoid any misunderstanding or awkward situation with your current employer. Pro Tip: Even the best headhunters and top recruiters are often ignored. But they’ll often remember the extremes: the people who were rude or the ones who were helpful. If you’re not interested, don’t be rude or ignore them. Instead offer to help by introducing them to any potential interested candidate you may know. A kind approach will allow you to build a network that will be there for you in case you need it in the future. How to Use Your Experience with Recruiters to Improve Your Job Search? Whether your relationship with a hiring recruiter has been fruitful or not, let them help you. Ask for feedback on your resume and tailor it to fit their needs. They know more than you when it comes to the position you’re applying for. And it’s in their own interest to present strong candidates to their clients, so welcome the extra help with open arms. Sometimes, they’ll even coach you to be more appealing to hiring managers. They have insights on what the hiring company is looking for and will help you increase your odds of getting a positive outcome. You just have to ask! The key here is to trust the headhunting agent, regardless of any previous encounters or experiences you’ve had with any other professional recruiters in the past. So steer away from arguing with or antagonizing the job search firm working with you. In most cases, they have the experience, insight and wisdom to give you the best tips as you move forward with the client employer. Take the time to engage with your hiring headhunter rather than just assuming you know everything you need to know to get the job. This way, you’ll be better equipped for you interviews and can highlight what’s important to your future employer. Should you apply directly or through a recruiter? There is no need to bypass a recruiter and apply for a job directly. If a hiring manager or professional recruiter finds out what you did, you’ll just risk being outed as unprofessional. Not worth it! Pro Tip: The hardest part of being in the headhunting business is when you have to let a candidate know his application wasn’t successful. No matter what, stay professional and react gracefully. Any hiring recruiter will more likely work with you in the future if you stay professional when hearing the bad news. Never contact the employer directly. Going behind the recruiter’s back will make you look bad in front of the hiring company AND the headhunting firm too. Trust your placement consultant to see you through the process. Don’t back out once you’ve agreed to be a candidate. If you’re not serious about going after a new opportunity, don’t bother working with a recruiter in the first place. New job or not, always say thank you. Failing to express gratitude will make you fall off the recruiter’s good graces. Giving your hiring headhunter a LinkedIn recommendation won’t hurt too. They might even return the gesture back to you! Be a resource even after you’ve landed the job. You can get great support from employment placement companies throughout your career if you help them out by recommending top-performers in your network.